Articles of arrangement signed at Honolulu, December 23, 1826, Entered into force. Articles of arrangement made and concluded at Oahu between Thomas ap Catesby Jones appointed by the United States, of one part, and Kauikeouli, King of the Sandwich Islands, and his Guardians, on the other part. United Kingdom of Great Britain and Ireland and the Kingdom of Hawai'i October 8, 1846 and the General Convention between Great Britian and the Kingdom of Hawai'i concluded on March 26, 1846. Ratification signed by Napolean III, Emperor of the French, on March 20, 1858, of the Treaty of Amity, Commerce and Navigation between the French Empire and the Kingdom of Hawaii, concluded on October 29, 1857. 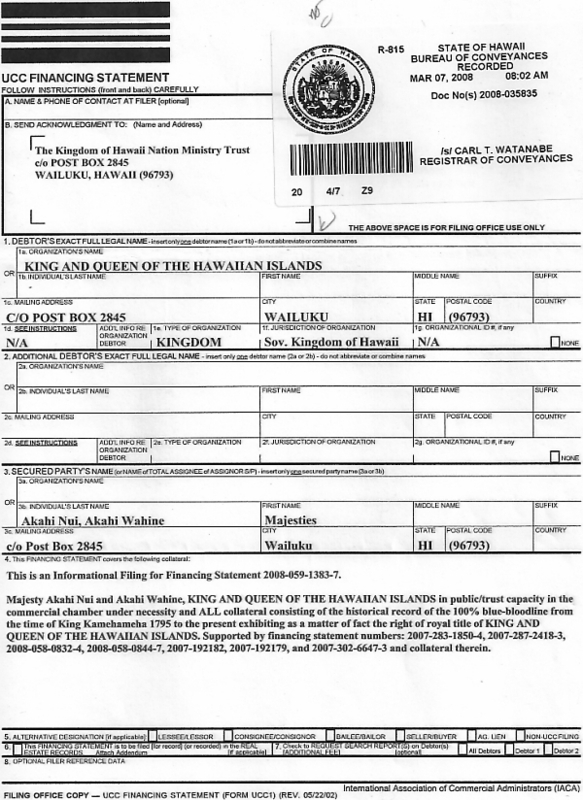 Postal Convention between the French Protectorate Government of Tahiti and Hawaiian Kingdom, concluded on 11 24, 1853. Agreement between Hamburg and the Hawaiian Islands, signed by R. C. Wyllie, Minister of Foreign Relations and E.A. Luwerkrop, Consul and Plenipotentiary for the Republic and free Hanseatic City of Hamburg on January 8, 1848. Treaty of Friendship, Commerce and Navigation with the United State of America - Concluded on December 20, 1849, with Ratification signed for the King and Premier by R. C. Wyllie, Minister of Foreign Affairs on August 19, 1850. Treaty of Friendship, Commerce and Navigation between the United Kingdom of Sweden and Norway and the Kingdom of the Hawaiian Islands, concluded on July 1, 1852, with Ratification signed by Oscar, King of Sweden and Norway and the Goths and Vandals. 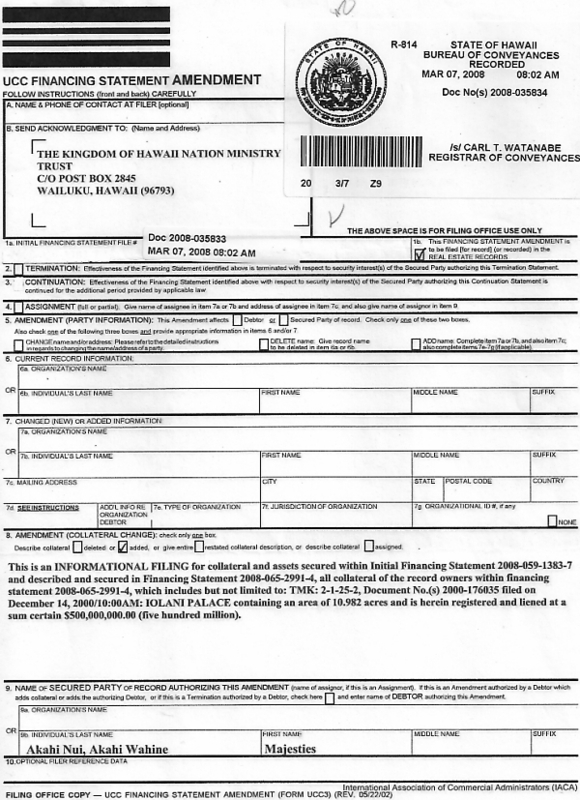 Convention and instrument of mutual agreement between the Hawiian Kingdom and the Hanseatic City of Bremen, signed by R. C. Wyllie, Minister of Foreign Relations and Stephen Reynolds, under special Authority from the Senate of Bremen on August 7, 1851. Treaty of Friendship between the Swiss Confederation and the King of the Hawaiian Islands, concluded on July 20, 1864, with Ratification signed by the President of the Swiss confederation on October 10, 1864, and Proces-Verbal, acknowledging receipt of the Hawaiian Kingdom's Ratification, signed the respective plenipotentiaries on November 18, 1868. Convention of Amity, Commerce and Navigation between Spain and the Hawaiian Islands, concluded on October 9, 1863, with Ratification signed by Dona Isabela II, Queen of Span, on July 27, 1865, and Certificate of Exchange of Ratifications, signed on May 11, 1870. Convention of Commerce and Navigation between Russia and the Kingdom of Hawaii, concluded on June 19, 1869, with Ratification signed by Alezander II, Emperor of all the Russias, on December 1, 1869. Postal Convention - New South Wales - (Australia) Signed at Honolulu, March, 10th 1874. Signed at Sydney, April, 13th 1874.
with a Declaration of Explanatory Notes signed on February 10, 1880, ratified and signed by Wilhelm, Emperor of Germany, on April 25, 1880, and with Protocol of Exchange of Ratification signed on April 26, 1880, from the records of the Foreign Office and Executive. 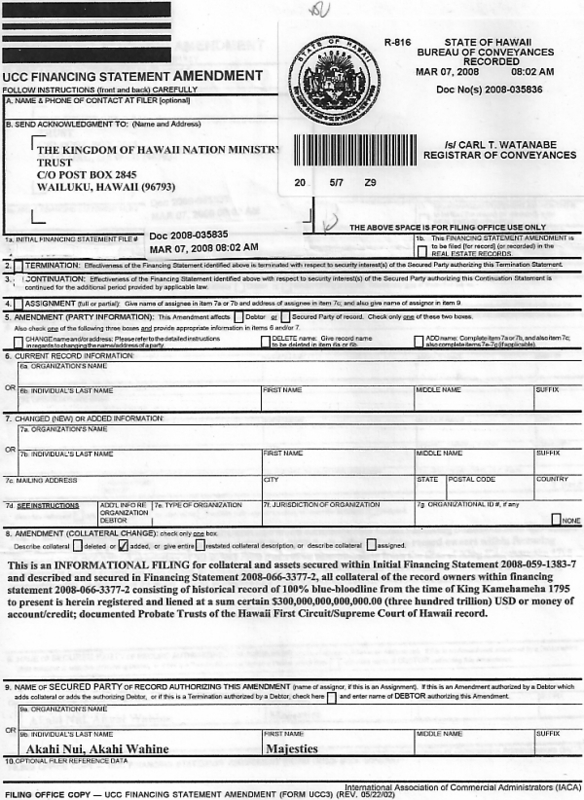 Rules for the regulation of a Money Order System between Hawaii and Hong Kong, signed by Charles T. Gulick, Minister of the Interior. 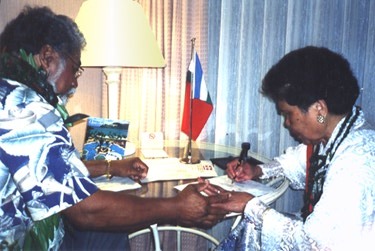 His Royal Majesty, Akahi Nui signs treaty with President Madame C. Bernard Tamaela, the Republic of Maluku (a Nation near E. Timor, currently dominated by Indonesia and like Hawai'i, striving for it's freedom). 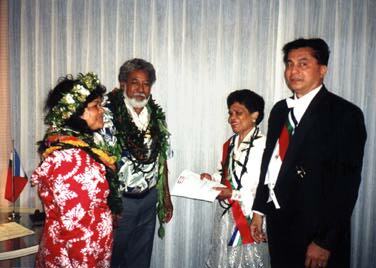 Their Majesties, HRM Akahi Nui and HRM Akahi Wahine along with President Madame C. Bernard Tamaela, and Dr. hc Randolph Delano Muller, Special Ambassador to the United Nations.